So, if you’re trying to make sense of the Big 12, just stop. It’s not worth the brain power. After all, what is there to say about Wednesday’s games? Well, the two programs occupying the cellar in the Big 12, Oklahoma State and West Virginia, both won, and ended up beating the two teams that will likely end up as the Nos. 4 and 5 seeds in next week’s Big 12 Tournament. Yep, after West Virginia (12-18, 4-13 in Big 12) clobbered Iowa State (20-10, 9-8), 90-75, Oklahoma State (11-19, 4-13) upended Baylor (19-11, 10-7), 67-64. The Bears were hoping to stay in that third-place tie with Kansas because the Bears face the Jayhawks on Saturday and they’re trying to slide into the No. 3 seed next week in Kansas City. Now, the Bears could still do it, if they beat Kansas on Saturday (the Bears would then be back in that third-place tie and own a season sweep). But the Bears have never won in Lawrence. Baylor simply didn’t shoot well in this one. The Bears finished 35 percent from the floor and 29.2 percent from the 3-point line. That’s been unusual for the Bears lately, and even at halftime the Bears were shooting well. Guard Makai Mason had 15 points at halftime (he ended up with 19 for the game), but only one other Bear hit double figures, and that was forward Freddie Gillespie, who had 14 points. With Mason and King McClure now healthy, the Bears have guard depth to burn. But the group did not shoot well from the arc, and that hurt as the game went on. Of course, Oklahoma State didn’t shoot that much better. While the Cowboys were 38.1 percent from the floor they were a horrid 17.2 percent from the 3-point line. The only player with multiple 3’s was Thomas Dziagwa, perhaps the Cowboys’ best pure shooter from distance. But even he was 2-of-11 from the 3-point line and he finished with 11 points. In fact, the “Core Three,” as I like to call Dziagwa, guard Lindy Waters III and forward Cameron McGriff, did not have a particularly good evening. Waters had just 9 points and hit one 3-pointer. McGriff had 5 points and 7 rebounds. The Cowboys adjusted by moving to more mid-range jumpers and drives to the basket, and in the second half it worked. Plus, the youngsters came to play. Isaac Likekele was thrown into the fire at the start of this season. The true freshman had to run the point for the Cowboys and learn on the job. That’s difficult in this conference and the growing pains have been enormous. But Likekele has grown into the job and he hit a critical mass on Wednesday night. He tied his career high with 23 points, added 9 rebounds and dished out 6 assists. He was scorer and facilitator in one on this night. Yor Anei, for a good portion of this season, has been a 6-foot-10 enigma. The freshman has talent, for sure. But it’s been a slow burn getting it where the Cowboys want it. Things are finally starting to click. 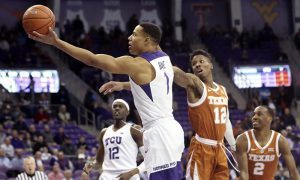 He finished with 14 points, 9 rebounds and 6 blocked shots in the win over Baylor, and in doing so set the freshman record for most blocked shots in a season. It’s the second time in four games than Anei has scored 10 or more points. He’s managed that feat just six times this season. Twice it’s happened against Baylor. The offense isn’t consistent yet. The rebounding is getting there. The shot blocking is definitely there. Next season, if he puts all three together, he’ll be tough to deal with. With 2:16 left Baylor’s Jared Butler was called for a foul that really wasn’t a foul on him. As Waters drove to the basket, he actually found a way to use his non-dribbling hand to pin Butler to his body as he tried to pivot and shoot. I’m not sure whether what Waters did was intentional or not, but Butler clearly didn’t initiate contact. Still, the official called Butler for the foul, which was his fifth. Waters made two free throws and the Cowboys outscored Baylor 6-3 the rest of the way. In the grand scheme of both teams’ seasons, it’s a blip. In the context of this game, it was a pivot point. Iowa State hasn’t been itself the past couple of weeks and it got worse. Marial Shayok, in the running for Big 12 Player of the Year, missed the game after a left foot injury on Monday. That was a huge hit for the Cyclones, but one figured they had enough talent to overcome it, given that they were facing a Mountaineers team that was tied for last in the league. Well, not so much, and this speaks more to where the Cyclones are as a team right now. The loss was ISU’s fifth in its last seven games, a nearly month-long downturn for a team that at one time had a meaningful shot at winning the Big 12 title. With as much offensive firepower as the Cyclones have, it’s hard to understand why. But then you look at the defense and you get it. In this seven-game stretch, the Cyclones have allowed 70 or fewer points just twice (those were both wins). What’s more worrisome is when the Cyclones lose, they seem to lose big. 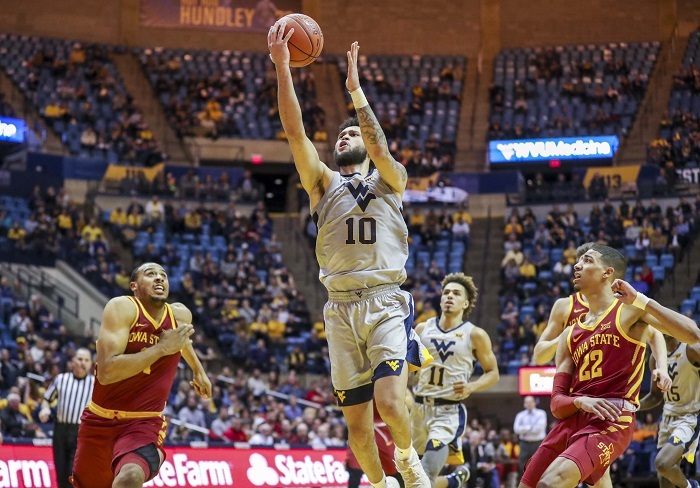 In those five losses, the Cyclones have up at least 73 points, and in two of those games the Cyclones gave up 90 or more, including to the Mountaineers. The Cyclones are a lock for the NCAA Tournament. But now they’re practically a lock for the No. 5 seed in the Big 12 Tournament (they could end up in a fifth-place tie with Texas, and the two teams split and I’m not sure who gets the seed at that point). The Cyclones are a team that could get hot at the right time and have a good tournament, but it’s not easy to see that future at the moment. ISU still scored points against the Mountaineers. Lindell Wigginton started and led with 17 points. Tyrese Halliburton had 12 points, Talen Horton-Tucker added 11 points and Nick Weiler-Babb had 10. The Mountaineers had to feel pretty good after this one. They shot nearly 50 percent from the floor, 40 percent from the 3-point line, had four players in double figures and two players with double-doubles. But Jermaine Haley stole the night with a career-high 28 points. Haley has seen his points go up in each of his last four games (from 13 to 18 to 23 to 28), so an explosion like this isn’t necessarily a surprise. But it would have been a surprise a month ago when the Mountaineers were a mess. Haley’s rise the past two weeks bodes well for next season. There are other good signs, too. The two double-doubles came from players expected to return — freshman forward Derek Culver (15 points, 11 rebounds) and junior forward Lamont West (12 points, 12 rebounds). Guard Jordan McCabe, another freshman, added 18 points. He’s averaged 18.8 points in his last four games. McCabe hadn’t cracked double figures before this four-game stretch. So as you’re applying your crystal ball to West Virginia, the future is finally starting to look better. Saturday is the regular-season finale for the Big 12 and there is drama all over the place. Kansas State hosts Oklahoma and Texas Tech travels to Iowa State. For the Wildcats and the Red Raiders, a share of the Big 12 regular-season title is on the line. 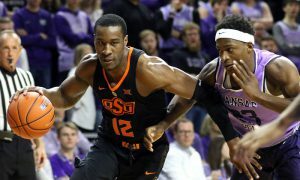 Baylor travels to Kansas, Texas hosts TCU in a huge game for both teams, and, West Virginia and Oklahoma State put a merciful ends to their seasons in Stillwater.